An in-depth report on the causes, diagnosis, treatment, and prevention of heart failure. Heart failure is a condition in which the heart does not pump enough blood to meet the needs of the body's tissues. It can have a number of causes. Heart failure can develop slowly over time as the result of other conditions (such as high blood pressure and coronary artery disease) that weaken the heart. It can also occur suddenly as the result of damage to the heart muscle or an acute valve problem. Treatment for heart failure depends on its severity. All patients need dietary salt restriction and other lifestyle adjustments, medication, and monitoring. People with severe heart failure may need implanted devices (such as pacemakers, implantable cardiac defibrillators, or devices that help the heart pump blood) or surgery, including heart transplantation. Not all patients will be placed on all these medications. But most of them will be prescribed at least for some of the patients. Ivabradine (Corlanor) works to decrease the heart rate. Sacubitril-valsartan (Entresto) is called a angiotensin-neprilysin inhibitor. This drug may be used in place of an ARB or ACE inhibitor under certain circumstances. For patients with advanced heart failure, symptom relief, quality of life, and personal values are as important to consider as survival, advises the American Heart Association (AHA). The AHA notes that while technology has increased the treatment options for advanced heart failure, "doing everything is not always the right thing." AHA guidelines emphasize a patient-centered approach to treatment and the importance of patients discussing with their doctors their preferences, expectations, and goals. Heart failure is a condition in which the heart does not pump enough blood to meet the needs of the body's tissues. To understand what occurs in heart failure, it helps to understand the anatomy of the heart and how it works.
. The ventricles are the major pumps in the heart. 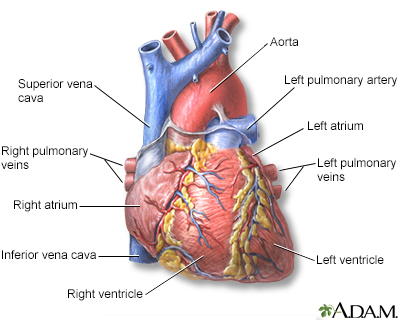 The structures of the heart include the ventricles, atria, arteries, and veins. Arteries carry blood away from the heart while veins carry blood into the heart. The vessels colored blue indicates the transport of blood with relatively low content of oxygen and high content of carbon dioxide. The vessels colored red indicates the transport of blood with relatively high content of oxygen and low content of carbon dioxide. is the first chamber that receives blood. The chamber expands as its muscles relax to fill with blood that has returned from the body. The right ventricle is one of the heart's two major pumps. Its function is to pump the blood into the lungs. The lungs restore oxygen to the blood and exchange it with carbon dioxide, which is exhaled. The oxygen-rich blood returns through veins coming from the lungs (pulmonary veins) to the heart. , the first chamber on the left side. , a powerful muscular chamber that pumps the blood back out to the body. The left ventricle is the strongest of the heart's pumps. Its thicker muscles need to perform contractions powerful enough to force the blood to all parts of the body. (the first and higher number in blood pressure measurement) indicates the pressure in the heart's arteries produced by this strong contraction. (the lower number in blood pressure readings) measures the arterial pressure produced when the left ventricle relaxes to refill with blood between beats. Blood leaves the heart through the aorta, the major artery that feeds blood to the entire body. 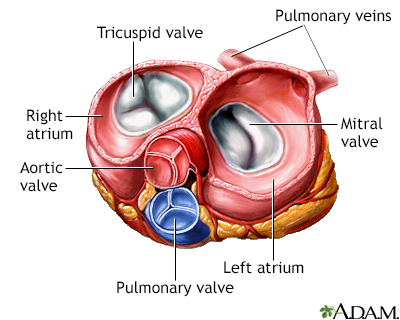 The tricuspid valve regulates blood flow between the right atrium and the right ventricle. 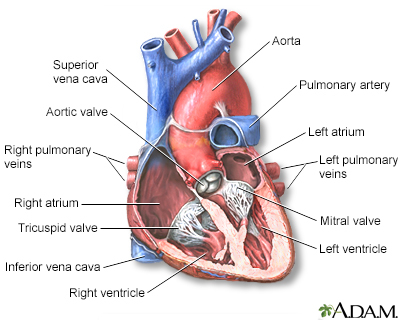 The pulmonary valve opens to allow blood to flow from the right ventricle to the lungs. 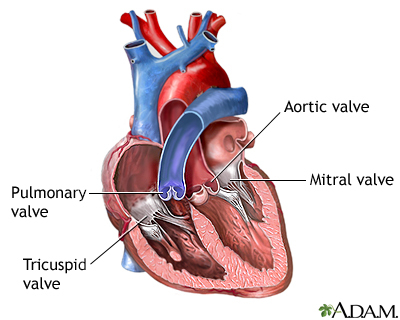 The mitral valve regulates blood flow between the left atrium and the left ventricle. The aortic valve allows blood to flow from the left ventricle to the aorta. Heartbeats are triggered and regulated by the conducting system, a network of specialized muscle cells that form a type of electrical system in the heart muscles. These cells are connected by channels that pass chemically-triggered electrical impulses. Heart failure is a clinical syndrome, not a single disease. The heart doesn't "fail" in the sense of ceasing to beat (as occurs during cardiac arrest). Rather, inefficient pumping can be caused by a number of factors. In classic heart failure, the heart muscle weakens, sometimes acutely (as with a big heart attack) or it weakens over the course of months or years, so that it is unable to pump out enough of the blood that enters its chambers. As a result, fluids build up in the lungs and tissues, causing congestion. This is why heart failure is also sometimes referred to as "congestive heart failure." 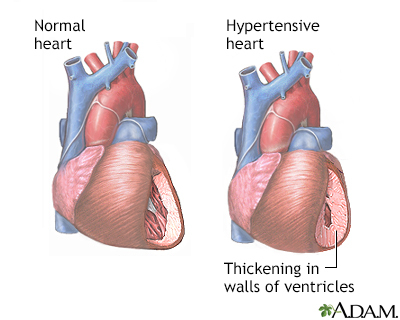 Other abnormalities can also cause heart failure. Some of them will be described below.
) and cannot pump the blood with enough force to reach all the body's tissues. This often happens because of coronary artery disease with or without a history of heart attacks. It can also occur as a result of a viral infection, or from drug use (certain prescription or illicit drugs), or the cause may remain unknown (idiopathic). The heart muscles become stiff or thick. They lose elasticity and cannot relax. Insufficient blood enters the chamber, so not enough blood is pumped out into the body to serve its needs. The most common reason for this is aging and a long history of high blood pressure (hypertension).
) the architecture of the heart and finally lead to irreversible problems. Heart failure's specific effects on the body depend on whether it occurs on the left or right sides of the heart. Over time, in either form of heart failure, the organs in the body do not receive enough oxygen and nutrients, and the body's wastes are removed slowly. Eventually, vital systems break down. Systolic heart failure is a pumping problem. In systolic failure, the heart muscles weaken and cannot pump enough blood throughout the body. The left ventricle is usually stretched (dilated). Fluid backs up and accumulates in the lungs (pulmonary edema). Systolic heart failure typically occurs in men between the ages of 50 to 70 years who have had a heart attack. Diastolic heart failure is a filling problem. When the left ventricle muscle becomes stiff and cannot relax properly between heartbeats, the heart cannot fill fully with blood. When this happens, fluid entering the heart backs up. This causes the veins in the body and tissues surrounding the heart to swell and become congested. People with diastolic failure are typically women, overweight, and older people, and have high blood pressure and diabetes. To help determine the severity of left-sided heart failure, doctors use an ejection fraction (EF) calculation, also called a left-ventricular ejection fraction (LVEF). This is the percentage of the blood pumped out from the left ventricle during each heartbeat. An EF of 50% to 75% or so is considered normal. People with left-ventricular heart failure are classified as either having a preserved EF (greater than 50%) or a reduced EF (less than 50%). People with preserved LVEF heart failure are more likely to be female. older ,and have a history of high blood pressure and atrial fibrillation (a disturbance in heart rhythm). They may also have some of the other risk factors listed above. Failure on the right side of the heart is most often a result of failure on the left. Because the right ventricle receives blood from the veins, failure here causes the blood to back up. As a result, the veins surrounding the heart fill up with blood and fluid. This fluid is pushed out into the body's tissues and causes swelling in the feet, ankles, legs, and abdomen. Pulmonary hypertension (increase in pressure in the lung's pulmonary artery) and lung disease may also cause right-sided heart failure. Heart failure has many causes and can evolve in different ways. It can be a direct, latest-stage result of heart damage from one or more heart or circulation diseases. In all cases, the weaker pumping action of the heart means that less blood is sent to the kidneys. The kidneys respond by retaining salt and water. This in turn increases edema (fluid buildup) in the body, which causes widespread damage. The heart muscles thicken to make up for increased blood pressure. The force of the heart muscle contractions weakens over time, and the muscles have difficulty relaxing. This prevents the normal filling of the heart with blood. Hypertension is a disorder characterized by consistently high blood pressure. In adults, high blood pressure is diagnosed when the systolic blood pressure (the "top" number, which represents the pressure generated when the heart beats) is 130 or higher or the diastolic blood pressure (the "bottom" number, which represents the pressure in the vessels when the heart is at rest) is 80 or higher. 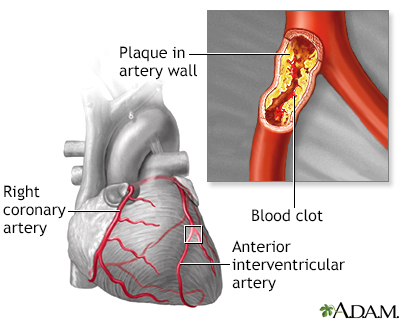 Coronary artery disease is the result of a process called atherosclerosis (commonly called "hardening of the arteries"). It is the most common cause of heart attack and involves the buildup of cholesterol in the arteries, with inflammation and injury in the cells of the blood vessels. The arteries narrow and become brittle. Heart failure in such cases most often results from a pumping defect in the left side of the heart. But both sides can be affected. People often survive heart attacks. But many eventually develop heart failure from the damage the attack does to the heart muscles. An in-depth report on the causes, diagnosis, treatment, and prevention of heart attack. The valves of the heart control the flow of blood leaving and entering the heart. Abnormalities can make it more difficult to get through a valve (stenosis) or cause blood to leak back through a valve (regurgitation or leaking). In the past, rheumatic fever, which scars the heart valves and prevents them from functioning properly, was a major cause of death from heart failure. Fortunately, antibiotics and other advances have now made this disease a minor cause of heart failure in industrialized nations. Birth defects may also cause abnormal valvular development. Although more children born with heart defects are now living to adulthood, they still face a higher than average risk for heart failure as they age. Cardiomyopathy is a disorder in which something has made the heart muscle abnormal and weakened, generally resulting in heart failure. There are several different types of cardiomyopathy. Injury to the heart muscles may cause the heart muscles to thin out (dilate) or become too thick (become hypertrophic). In either case, the heart doesn't pump correctly. A viral infection involving the heart muscle (viral myocarditis) is a rare viral infection that involves the heart muscle and can produce either temporary or permanent heart muscle damage. 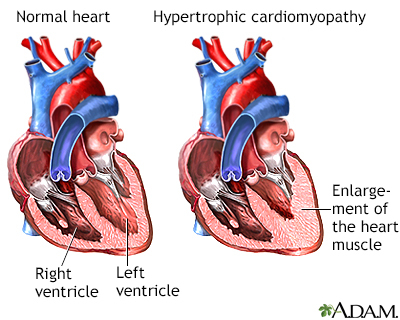 Dilated cardiomyopathy involves an enlarged heart ventricle. The muscles thin out, reducing the heart's pumping action, usually on the left side. Although this condition is associated with genetic factors, the direct cause is often not known. (This is called idiopathic dilated cardiomyopathy.) In other cases, heart attacks, viral infections, alcoholism or other toxins, or long term, untreated high blood pressure may result in a dilated, dysfunctional heart. In hypertrophic cardiomyopathy, the heart muscles become thick, which can cause mechanical and electrical problems in the heart. Sometimes the walls of the heart become so thick that blood has difficulty being ejected from the heart. People may be at risk for sudden, deadly arrhythmias because of abnormalities in the conduction system. Hypertrophic cardiomyopathy may be due to a genetic defect that causes abnormalities in the heart muscle cells themselves. This condition occurs in about 1:500 people in the general population and is often the cause of sudden death in young athletes. Restrictive cardiomyopathy refers to a group of disorders in which the heart chambers are unable to properly fill with blood because of extreme stiffness in the heart. The heart is of normal size or only slightly enlarged. However, it cannot relax normally during the time between heartbeats when the blood returns from the body to the heart (diastole). The most common causes of restrictive cardiomyopathy are amyloidosis and scarring of the heart from an unknown cause (idiopathic myocardial fibrosis). It may occur after heart transplant. Chronic obstructive pulmonary disease (COPD, a disease characterized by severe chronic bronchitis or emphysema) and other major lung diseases are risk factors for right-sided heart failure. Pulmonary hypertension is increased pressure in the pulmonary arteries that carry blood from the right side of the heart to the lungs. The increased pressure makes the heart work harder to pump blood, which can cause heart failure. An overactive thyroid (hyperthyroidism) or underactive thyroid (hypothyroidism) can have severe effects on the heart and increase the risk for heart failure. Coronary artery disease, heart attack, and high blood pressure are the main causes and risk factors of heart failure. Other diseases that damage or weaken the heart muscle or heart valves can also cause heart failure. Heart failure is most common in people over age 65, African-Americans, and women. Heart failure risk increases with advancing age. Heart failure is the most common reason for hospitalization in people age 65 years and older. Men are at higher risk for heart failure than women. However, women are more likely than men to develop diastolic heart failure (a failure of the heart muscle to relax normally). African-Americans are more likely than white people to develop heart failure before age 50 and die from the condition. People with a family history of cardiomyopathies (diseases that damage the heart muscle) are at increased risk of developing heart failure. Researchers are investigating specific genetic variants that increase heart failure risk. People with diabetes are at high risk for heart failure, particularly if they also have coronary artery disease and high blood pressure. Some types of diabetes medications, such as rosiglitazone (Avandia) and pioglitazone (Actos), may cause or worsen heart failure. Chronic kidney disease caused by diabetes also increases heart failure risk. Obesity is associated with high blood pressure, high cholesterol levels, and type 2 diabetes, conditions that place people at risk for heart failure. Evidence strongly suggests that obesity itself is a major risk factor for heart failure, particularly in women. Smoking, sedentary lifestyle, and alcohol and drug abuse can increase the risk for developing heart failure. Certain drugs can potentially damage the heart and increase the risk for heart failure. Long-term use of high-dose anabolic steroids (male hormones used to build muscle mass) increases the risk for heart failure. The cancer drug imatinib (Gleevec) has been associated with heart failure. Other chemotherapy drugs, such as doxorubicin (Adriamycin), can increase the risk for developing heart failure years after cancer treatment. Cancer radiotherapy to the chest also increases the risk for heart disease and heart failure. The complications caused by heart failure influence a patient's chance for survival. Although heart failure produces very high mortality rates, treatment advances are improving survival rates. , which is unintentional rapid weight loss (a loss of at least 7.5% of normal weight within 6 months). Heart failure weakens the heart's ability to pump blood. This can affect other parts of the body including the kidneys (which in turn can lead to fluid buildup). Decreased kidney function is common in patients with heart failure, both as a complication of heart failure and other diseases associated with heart failure (such as diabetes). Studies suggest that, in patients with heart failure, impaired kidney function increases the risks for heart complications, hospitalization, and death. In left-sided heart failure, fluid builds up first in the lungs, a condition called pulmonary edema. Later, as right-sided heart failure develops, fluid builds up in the legs, feet, and abdomen. Fluid buildup is treated with lifestyle measures, such as reducing salt in the diet, as well as drugs, such as diuretics. A rapid quivering beat in the upper chambers of the heart. It is a major cause of stroke, especially for people with heart failure. Atrial fibrillation can also make other aspects of a patient's heart failure more difficult to manage. 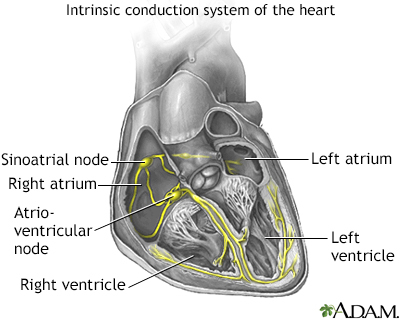 While not an arrhythmia per se, it is an abnormality in electrical conduction in the heart. It develops in about 30% of people with heart failure. Ventricular tachycardia and ventricular fibrillation. Life-threatening arrhythmias that can occur in people when heart function is significantly impaired. Some people with heart failure may be offered an implanted defibrillator to protect them from these arrhythmias. While coronary artery disease is a major cause of heart failure, people with heart failure are at continued risk for angina and heart attacks. Special care should be taken with sudden and strenuous exertion, particularly during colder months, with activities such as snow shoveling. Patients may feel unusually tired. Orthopnea refers to the shortness of breath felt when lying flat. People may report that they need to use one or two pillows underneath their head and shoulders in order to be able to sleep. Sitting up with legs hanging over the side of the bed often relieves symptoms. Paroxysmal nocturnal dyspnea (PND) refers to sudden episodes that cause awakening at night. Symptoms include severe shortness of breath and coughing or wheezing, which generally occur 1 to 3 hours after going to sleep. Unlike orthopnea, symptoms are not immediately relieved by sitting up. It usually takes more time to recover from an episode. Heart failure can cause foot, ankle, leg, or abdominal swelling. In rare cases, swelling can occur in the veins of the neck. Fluid retention can cause sudden weight gain and frequent urination. Heart failure can cause asthma-like wheezing, or a dry hacking cough that occurs a few hours after lying down and stops after sitting up. Over time, patients may lose muscle weight due to low cardiac output and a significant reduction in physical activity. Problems include loss of appetite or a sense of feeling full after eating small amounts. People may also have abdominal pain. In addition to shortness of breath, people sometimes have a cough that produces a pinkish froth. People may experience a bubbling sensation in the lungs and feel as if they are drowning. Typically, the skin is clammy and pale, sometimes nearly blue. This is a life-threatening situation, and the person must go immediately to an emergency room. Heart failure can cause episodes of abnormally fast or slow heart rate. People may need to have a pacemaker or defibrillator implanted. This sleep disorder results when the brain fails to signal the muscles to breathe during sleep. It occurs in up to half of people with heart failure. Sleep apnea causes disordered breathing at night. If heart failure progresses, the apnea may be so acute that a person, unable to breathe, may awaken from sleep in panic. Treatment with continuous positive airway pressure (CPAP) can be beneficial for people with heart failure and sleep apnea. Doctors can often make a preliminary diagnosis of heart failure by medical history and careful physical examination. Complete blood counts to check for anemia. Blood and urine tests to check kidney function. Sodium, potassium, and other electrolyte levels. Brain natriuretic peptide (BNP) levels. BNP is a hormone that increases during heart failure. BNP testing can be very helpful in correctly diagnosing heart failure in people who come to the emergency room complaining of shortness of breath (dyspnea). Thickening of the heart muscle, which may help to determine long-term outlook. A finding called a prolonged QT interval may indicate people with heart failure who are at risk for severe complications and therefore need more aggressive therapies or medication adjustments. The electrocardiogram (ECG, EKG) is used extensively to diagnose heart disease, from congenital heart disease in infants to myocardial infarction and myocarditis in adults. 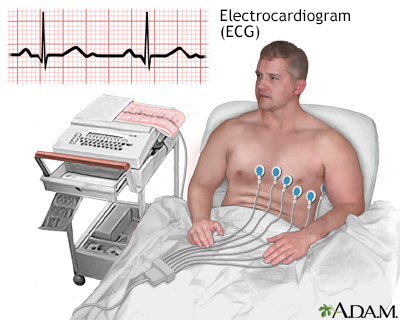 There are several different types of electrocardiograms. (ejection fraction, a measurement of how much blood is pumped out during each heartbeat), which is important for diagnosing heart failure and determining its severity. Stress echocardiography may be needed if coronary artery disease is suspected. Doctors may recommend angiography if they suspect that blockage of the coronary arteries is contributing to heart failure. This procedure is invasive. 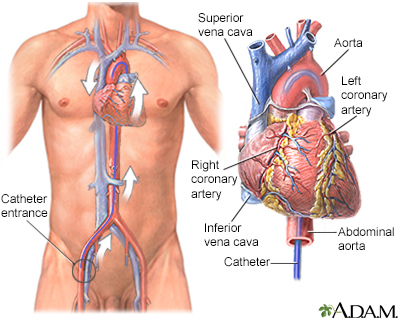 A thin tube called a catheter is inserted into one of the large arteries in the arm or leg. It is gently guided through the artery until it reaches the heart. The catheter measures internal blood pressure at various locations, giving the doctor a picture of the extent and severity of the heart failure. Dye is then injected through the tube into the heart. X-rays called angiograms are taken as the dye moves through the heart and arteries. These images help locate problems in the heart's pumping action or blockage in the arteries. Radionuclide ventriculography is an imaging technique that uses a tiny amount of radioactive material (called a trace element). It is very sensitive in revealing heart enlargement or evidence of fluid accumulation around the heart and lungs. It is an accurate way to measure the EF, although an echocardiogram is a much more common way to do this. Chest x-rays can show whether the heart is enlarged. Computed tomography (CT) and magnetic resonance imaging (MRI) may also be used to evaluate the heart valves and arteries. Myocardial PET scans may be performed on certain patients to evaluate blood flow to the heart muscle. The exercise stress test measures heart rate, blood pressure, and electrocardiographic changes while a patient is performing physically, usually walking on a treadmill. It can help determine heart failure symptoms. Doctors also use exercise tests to evaluate long-term outlook and the effects of particular treatments. A stress test may be done using echocardiography or may be done with nuclear imaging (called myocardial perfusion imaging). Heart failure is classified into four stages (Stage A through Stage D) that reflect the development and progression of the condition. Treatment depends on the stage of heart failure. Stage A is not technically heart failure but indicates that a patient is at high risk for developing it. In Stage B, the patient has had damage to the heart (for example, from a heart attack), but no symptoms of heart failure. In Stage C, heart failure symptoms manifest. Stage D is advanced heart failure accompanied by symptoms that may be difficult to manage with standard drug treatments and may require more technologically complex care (defibrillators, mechanical pumps, heart transplantation). The American Heart Association (AHA) emphasizes the importance of a patient-centered approach to treatment decisions. People with advanced heart failure should have ongoing honest discussions with their health care providers concerning their personal preferences and quality of life goals. In Stage A, people are at high risk for heart failure, but do not show any symptoms or have any structural damage of the heart. The first step in managing or preventing heart failure is to treat the primary conditions that cause or complicate heart failure. Risk factors include high blood pressure, heart diseases, diabetes, obesity, metabolic syndrome, and previous use of medications that damage the heart (such as some chemotherapy). Coronary artery disease. Treatment includes a healthy diet, exercise, smoking cessation, medications, and possibly bypass surgery or angioplasty/stenting. Cholesterol and lipid problems. Treatments include lifestyle management and medications, especially statin drugs. High blood pressure. A normal systolic blood pressure is considered below 120 mm Hg, and a normal diastolic blood pressure is below 80 mm Hg. High blood pressure is diagnosed when measurements are 130/80 mm Hg or above. Reducing blood pressure can reduce the risk for developing heart failure. The treatment of type 1 diabetes and type 2 diabetes is extremely important for reducing the risk for heart disease. ACE inhibitors are especially beneficial, particularly for people with diabetes. Research suggests that metformin, a drug used to treat diabetes, may also help prevent heart failure. Obesity. Obesity affects cardiovascular health and should be considered and treated as a disease. Guidelines recommend that doctors create individualized weight loss plans forvpeople who are overweight or obese. , such as aortic stenosis and mitral regurgitation. Surgery may be required. Ventricular assisted devices, notably biventricular pacers (BVPs), can help prevent hospitalizations for patients with these conditions. Anemia. People with heart failure and underlying anemia should have their anemia corrected. On occasion, this may require erythropoiesis-stimulating drugs. Various medications are used to treat overactive thyroid (hyperthyroidism) or underactive thyroid (hypothyroidism). Avoid drugs that can worsen heart failure symptoms or cause damage to the heart muscle. Talk with your doctor about your heart failure before taking nonsteroidal anti-inflammatory drugs (NSAIDs), calcium channel blockers (verapamil and diltiazem), thiazolidinediones (drugs used for diabetes), anti-tumor necrosis factor medications, and most drugs used to treat irregular heart rhythms (arrhythmia). Choice of cancer drugs (or whether to use radiation therapy) may be altered due to the presence of heart failure. It is particularly important to reduce sodium (salt) intake to less than 2,400 mg a day (ask your doctor for specific sodium intake goals). People should engage in medically supervised exercise programs. Dietary changes and exercise are important for treating all stages of heart failure. Angiotensin-converting enzyme (ACE) inhibitors are recommended for all patients with reduced EF to prevent heart failure. ACE inhibitors are also recommended for many people who have a history of heart attack. Angiotensin-receptor blockers (ARBs) are appropriate for patients who cannot tolerate ACE inhibitors. Beta blockers are recommended for all patients with reduced EF or a history of heart attack. They are also recommended for people who have not had a heart attack, but who do have reduced LVEF identified in diagnostic tests. An implantable cardiac defibrillator (ICD) may be appropriate for people who have had a heart attack at least 40 days prior and have reduced LVEF. Restrict dietary sodium (salt). Lowering sodium in the diet can help diuretics work better. Exercise training and cardiac rehabilitation for appropriate patients. ACE inhibitor, or ARB as alternative. Beta blockers (bisoprolol, carvedilol, and sustained release metoprolol). Diuretics are recommended for most people, with loop diuretics such as furosemide generally being the first-line choice. Aldosterone inhibitors are recommended for many people. Digitalis may be prescribed for some people. A hydralazine and nitrate combination (BiDil) may be used for African-American patients who are taking an ACE inhibitor and beta blocker and who still have heart failure symptoms. Anticoagulants for people who have heart failure and atrial fibrillation and are at risk for stroke. ICDs may be considered for people with very low EF or those who have had dangerous arrhythmias. Cardiac resynchronization therapy (pacemaker), with or without ICD, for some people. Ivabradine (Corlanor) may help with heart failure by decreasing the heart rate. It is more likely to be used after treatment with an ACE inhibitor or ARB, beta blocker, and spironolactone have been maximized generally when the resting heart rate remains above 70 beats per minute. Sacubitril-valsartan (Entresto) is called an angiotensin-neprilysin inhibitor. This drug may be used when other heart failure medicines have been maximized, the EF is low, and BNP levels remain elevated. Strict control of fluid retention. Heart transplantation referral for appropriate patients. Left-ventricular assist devices (LVADs) as permanent therapy for people who are not candidates for heart transplants. LVADs are surgically implanted to help pump blood through the body. Hospice and end-of-life care information for patients and families. Patients have the right to choose or decline treatments based on their personal preferences, values, and goals. Quality of life is as important a consideration as survival. Sometimes as little as eating a sausage or some sauerkraut with a high sodium content is enough to precipitate an acute episode. Failure to comply with fluid and salt restrictions must be considered whenever heart failure worsens. Depending on the severity of a person's heart failure, one or more drinks may suddenly worsen symptoms. People may forget or purposely skip a medication, or they may not be able to afford or have access to medications. Worsening of coronary artery disease may make the heart muscle less able to pump enough blood. Increases in the heart rate, or a slowing of the heart rate below normal, may also affect the ability of the heart to function. Likewise, an irregular heart rhythm such as atrial fibrillation may cause a flare-up. It is unclear whether anemia causes heart failure or is a symptom of heart failure. Some anemias may be treated with iron replacement therapy. A more significant anemia can cause a worsening of heart failure and should be treated promptly. ACE inhibitors are among the most important drugs for treating people with heart failure. ACE inhibitors open blood vessels and decrease the workload of the heart. They are used to treat high blood pressure but can also help improve heart and lung muscle function. ACE inhibitors are particularly important for people with diabetes, because they also help slow the progression of kidney disease. Low blood pressure is the main side effect of ACE inhibitors. This can be severe in some people, especially at the start of therapy. Irritating cough is a common side effect, which some people find intolerable. All ACE inhibitors can have this side effect. An ARB can be used in place of an ACE inhibitor if cough is a problem. Although ACE inhibitors can protect against kidney disease, they also increase potassium retention by the kidneys. This increases the risk for cardiac arrest (when the heart stops beating) if potassium levels become too high. Because of this action, they are generally only given with potassium-sparing diuretics or potassium supplements when closely monitored. People who have difficulty tolerating ACE inhibitor side effects are usually switched to an ARB. ARBs, also known as angiotensin II receptor antagonists, are similar to ACE inhibitors in their ability to open blood vessels and lower blood pressure. They may have fewer or less-severe side effects than ACE inhibitors, especially coughing, and are sometimes prescribed as an alternative to ACE inhibitors. Beta blockers are almost always used in combination with other drugs, such as ACE inhibitors and diuretics. They help slow heart rate and lower blood pressure. They are used even when abnormally fast heart rhythms (such as atrial fibrillation) are not present and when used properly, beta blockers can reduce the risk of death or rehospitalization. Over time, an EF that is low may increase with beta blocker therapy. DO NOT abruptly stop taking these drugs. The sudden withdrawal of beta blockers can increase the risk of angina and even a heart attack. If you need to stop your beta-blocker, your doctor may want you to slowly decrease the dose before stopping completely. In addition, when first starting on a beta blocker, your doctor may start at a very low dose and increase it slowly to avoid problems. Beta blockers are categorized as non-selective or selective. Non-selective beta blockers, such as carvedilol, can narrow bronchial airways. People with asthma, emphysema, or chronic bronchitis may need to avoid non-selective beta blockers. Beta blockers can lower HDL (good) cholesterol, although the benefits they provide for coronary artery disease and heart failure outweigh any bad effects on cholesterol. These drugs can hide warning signs of low blood sugar (hypoglycemia) in patients with diabetes, especially those who take insulin. Check with your doctor about any side effects. DO NOT stop taking these drugs on your own. Diuretics cause the kidneys to rid the body of excess salt and water. Fluid retention is a major symptom of heart failure. Aggressive use of diuretics can help eliminate excess body fluids, while reducing hospitalizations and improving exercise capacity. These drugs are also important to help prevent heart failure in people with high blood pressure. In addition, certain diuretics, notably spironolactone (Aldactone, generic), block aldosterone, a hormone involved in heart failure. This drug class is beneficial for people with more severe heart failure (Stages C and D). Diuretics come in many brands and are generally inexpensive. Some need to be taken once a day, some more often a day. Diuretics are usually started at a low dose and gradually increased. Your doctor may advise you to adjust the amount and timing of the diuretic if you notice swelling or weight gain. Diuretics are virtually always used in combination with other drugs, especially ACE inhibitors and beta blockers. diuretics include amiloride (Midamor, generic), spironolactone (Aldactone, generic), and triamterene (Dyrenium, generic). diuretics include chlorothiazide (Diuril, generic), chlorthalidone (Clorpres, generic), indapamide (Lozol, generic), hydrochlorothiazide (Esidrix, generic), and metolazone (Zaroxolyn, generic). diuretics are considered the preferred diuretic type for most patients with heart failure. They include bumetanide (Bumex, generic), furosemide (Lasix, generic), and torsemide (Demadex, generic). In addition to increased urination, all types of diuretics may cause dry mouth, dehydration, fatigue, muscle cramps, and dizziness and lightheadedness. Diuretics can increase the amount of uric acid in the blood, which can lead to gout. Potassium-sparing diuretics can cause abnormally high levels of potassium. This can be especially dangerous for people who have pre-existing elevated levels of potassium or those with damaged kidneys. It is very important not to take potassium supplements or eat foods high in potassium (like bananas) when taking this type of diuretic unless your doctor instructs you to do so. Loop and thiazide diuretics can cause too-low potassium levels, which increase the risk for life-threatening heart rhythm disturbances (arrhythmias). If this occurs, your doctor may prescribe a lower dose, recommend potassium supplements, or prescribe a potassium-sparing diuretic either alone or in combination with a thiazide or loop diuretic. Aldosterone is a hormone that is critical in controlling the body's balance of salt and water. Excessive levels play important roles in high blood pressure and heart failure. Drugs that block aldosterone are prescribed for some people with symptomatic heart failure. They reduce death rates for people with heart failure and coronary artery disease, especially after a heart attack. Aldosterone blocker brands include spironolactone (Aldactone, generic) and eplerenone (Inspra, generic). Like loop and thiazide diuretics, aldosterone blockers can cause abnormally high levels of potassium in the blood. In is uncommon for people to need to take potassium supplements at the same time as this drug and may need to avoid foods with high potassium content. Digitalis is derived from the foxglove plant. It has been used to treat heart disease since the 1700s. Digoxin (Lanoxin, generic) is the most commonly prescribed digitalis preparation. Digoxin can make the heart beat more strongly, decreases heart size and reduce certain heart rhythm disturbances (arrhythmias). Although it was once a mainstay of heart failure treatment, it is now used less often than newer drugs and is generally reserved for select patients who have significant symptoms while on maximal medical therapy. While digitalis is generally a safe drug, it can have severe adverse side effects. The most serious side effects are caused by overdose and includes serious arrhythmias. Hydralazine and nitrates are two older drugs that help relax arteries and veins, thereby reducing the workload of the heart and allowing more blood to reach the tissues. They are used primarily for people who are unable to tolerate ACE inhibitors and angiotensin receptor blockers. BiDil is a drug that combines isosorbide dinitrate and hydralazine. BiDil is approved to specifically treat heart failure in African-American patients while on other standard medications (such as beta blockers and ACE inhibitors). Statins are important drugs used to lower cholesterol. Statins can help prevent coronary heart disease, which is a leading cause of heart failure. They can also help slow the progression to heart failure for people who have had heart attack or acute coronary syndrome. These drugs include lovastatin (Mevacor, generic), pravastatin (Pravachol, generic), simvastatin (Zocor, generic), fluvastatin (Lescol), atorvastatin (Lipitor, generic), rosuvastatin (Crestor), and pitavastatin (Livalo). Atorvastatin is specifically approved to reduce the risks for hospitalization for heart failure in people with coronary heart disease. Antiplatelet and anticoagulant drugs help thin the blood and prevent the formation of blood clots. It is not clear if these drugs are helpful for patients with heart failure who are not at risk for blood clots. These drugs increase the risk for bleeding. Aspirin is an anti-platelet drug and a type of nonsteroid anti-inflammatory drug (NSAID). Aspirin is recommended for protecting people with (primarily atherosclerotic) heart disease, and can safely be used with ACE inhibitors, particularly when it is taken in lower dosages (75 to 81 mg). Anticoagulants may be appropriate for patients with heart failure and atrial fibrillation to reduce the risk of stroke. Anticoagulants include warfarin (Coumadin, generic), dabigatran (Pradaxa), apixaban (Eliquis), eboxaban (Savavasa), and rivaroxaban (Xarelto). Sacubitril-valsartan (Entresto) is a combination angiotensin receptor-neprilysin inhibitor which is usually started in people with severe systolic heart failure to replace an ACE inhibitor or an ARB. Ivabradine (Corlanor) is a medication which slows the heart rate and can be useful in some heart failure patients with a heart rate over 70 beats per minute on a beta blocker or who cannot be on a beta blocker. Erythropoietin is used to treat anemia, which is a common complication of heart failure. This drug can increase the risk of blood clots and stroke. Due to these risks, recent guidelines recommend against the use of erythropoietin drugs for people with heart failure and mild-to-moderate anemia. Tolvaptan (Samsca) is a drug approved for treating hyponatremia (low sodium levels) associated with heart failure and other conditions. Revascularization helps to restore blood flow to heart affected by coronary artery disease. It can treat blocked arteries in patients with coronary artery disease and angina, and may help select patients with heart failure who have these conditions. Techniques include coronary artery bypass graft (CABG) and angioplasty usually with stenting (also called percutaneous coronary intervention [PCI]). CABG is a traditional type of open heart surgery. Angioplasty is a less-invasive procedure that uses a catheter to inflate a balloon inside the artery. A metal stent may also be inserted during an angioplasty procedure. Click the icon to see images of a coronary artery balloon angioplasty. Click the icon to see an image of normal heart anatomy. Pacemakers, also called pacers, help regulate the heart's beating action, especially when the heart beats too slowly. Biventricular pacers (BVPs) are a special type of pacemaker used for patients with heart failure. Because BVPs help the heart's left and right chambers to beat in a more coordinated fashion, this treatment is called cardiac resynchronization therapy (CST). BVPs are recommended for patients with heart failure that is not controlled with medication therapy and who have evidence of left-bundle branch block on their ECG. Left-bundle branch block is a condition in which the electrical impulses in the heart do not follow their normal pattern, causing the heart to pump inefficiently. People with enlarged hearts that beat weakly are at risk for having serious cardiac arrhythmias (abnormal heartbeats) that are associated with sudden death. Implantable cardioverter defibrillators (ICDs) can quickly detect life-threatening arrhythmias. The ICD is designed to convert any abnormal heart rhythm back to normal by sending an electrical shock to your heart. This action is called defibrillation or cardioversion. This device can also work as a pacemaker. People with ICDs need to avoid certain types of electronic devices that can disrupt the device. They may also need to avoid certain types of medical and imaging procedures. It is important to talk with your doctor about any questions you have about living with an ICD. Be sure to let your doctor know if you feel anxious or depressed. It's not uncommon for people with ICDs to experience these emotions, and psychological support is important for both patients and their families. In recent years, certain ICD models and biventricular pacemaker defibrillators have been recalled by the manufacturers because of circuitry flaws. However, doctors stress that the chance of an ICD or pacemaker saving a person's life far outweigh the possible risks of these devices failing. Ventricular assist devices (VAD) are mechanical devices that pump blood through the body. They are used as a bridge to transplant for patients who are on medications but still have severe symptoms and are waiting for a donor heart. In some cases, they may delay the need for a transplant. Therefore, they may be used as short-term (less than 1 week) or longer-term support. LVADs are used for people whose heart beat has weakened dangerously, to help take over the pumping action of the failing heart. Until recently, these machines required that patients remain in the hospital. Smaller battery-powered implanted LVAD units are now allowing many people to leave the hospital while they wait for a transplant. Intra-aortic balloon pumps (IABP) are helpful for temporarily maintaining heart function in people with left-side failure who are waiting for transplants, and for those who develop a sudden and severe deterioration of heart function. The IABP is an implanted thin balloon that is usually inserted into the artery in the leg and threaded up to the aorta. Its pumping action is generating by inflating and deflating the balloon at certain rates. People with balloon pumps must stay in the hospital in bed in an intensive care unit. Another assist device called an Impella is also placed in the aorta, but a portion crosses the aortic valve and helps to pump blood from the left ventricle into the aorta. It can provide more assistance than an IABP. Fully implanted miniature artificial pumps that assist the heart are also being tested. The risks and complications involved with many of these devices include bleeding, blood clots, and right-side heart failure. Infections are a particular hazard. People who suffer from severe heart failure and whose symptoms do not improve with drug therapy or mechanical assistance may be candidates for heart transplantation. About 2,000 heart transplant operations are performed in the United States each year, but thousands more patients wait on a list for a donor heart. The most important factor for heart transplant eligibility is overall health. Chronological age is less important. Most heart transplant candidates are between the ages of 50 to 64 years. While the risks of this procedure are high, about 85% to 90% of patients survive the first year after receiving a heart transplant, and about 75% survive for 3 years. Survival after 10 years is about 56%. In general, the highest risk factors for death, 3 or more years after a transplant operation are a special kind of coronary artery disease (called transplant vasculopathy) and the adverse effects (infection and certain cancers) of immunosuppressive drugs used in the procedure. Artificial hearts are implantable devices that serve as replacement for the heart's failing valves. There are several types of artificial hearts. The SynCardia Total Artificial Heart is used to help sustain patients who are waiting for a heart transplant. AbioCor is a permanent implantable artificial heart. It is available only for patients who are not eligible for a heart transplant and who are not expected to live more than a month without medical treatment. Both of these devices are very expensive, require complex surgery, and only extend survival by a few months. People need to have a chest cavity large enough to contain the device, which excludes most women. New artificial heart systems are being developed and tested. Up to half of patients hospitalized for heart failure are back in the hospital within 6 months. Many people return because of lifestyle factors, such as poor diet, failure to comply with medications, and social isolation. Programs that offer intensive follow-up to ensure that the patient complies with lifestyle changes and medication regimens at home can reduce rehospitalization and improve survival. Patients without available rehabilitation programs should seek support from local and national heart associations and groups. A strong emotional support network is also important. Medicare recently approved cardiac rehabilitation for some patients with heart failure. Ask your doctor if a program near you may be appropriate. A sudden increase in weight of more than 2 to 3 pounds may indicate fluid accumulation and should prompt an immediate call to the doctor. Rapid wasting weight loss over a few months is a very serious sign and may indicate the need for intervention. All patients with heart failure should limit their sodium (salt) intake to less than 2,400 mg a day. (Check with your doctor for exact sodium limits.) DO NOT add salt to cooking and meals, and avoid foods high in sodium. These salty foods include ham, bacon, hot dogs, lunch meats, prepared snack foods, dry cereal, cheese, canned soups, soy sauce, and condiments. Some people may need to reduce the amount of water they consume. People with high cholesterol levels or diabetes require additional dietary precautions. Look for foods that are labeled "low-sodium," "sodium-free," "no salt added," or "unsalted." Check the total sodium content on food labels. Be especially careful of canned, packaged, and frozen foods. A nutritionist can teach you how to understand these labels. DO NOT cook with salt or add salt to what you are eating. Try pepper, garlic, lemon, or other spices for flavor instead. Be careful of packaged spice blends as these often contain salt or salt products (like monosodium glutamate, MSG) or too much potassium. Avoid processed meats (particularly cured meats, bacon, hot dogs, sausage, bologna, ham, and salami). Exercise is not appropriate for all patients with heart failure. If you have heart failure, always consult your doctor before starting an exercise program. People who are approved for, but not used to, exercise should start with 5 to 15 minutes of easy exercise with frequent breaks. Although the goal is to build up to 30 to 45 minutes of walking, swimming, or low-impact aerobic exercises three to five times every week, even shorter times spent exercising are useful. Progressive strength training may be particularly useful for patients with heart failure since it strengthens muscles, which commonly deteriorate in this disorder. Strength training typically uses light weights, weight machines, or even the body's weight (leg raises or sit-ups, for example). Even performing daily handgrip exercises can improve blood flow through the arteries. Patients who exercise regularly using supervised treadmill and stationary-bicycle exercises can increase their exercise capacity. Exercising the legs may help correct problems in heart muscles. Exercise has also been associated with reduced inflammation in blood vessels. Some people with severe heart failure need periods of bed rest. To reduce congestion in the lungs, the patient's upper body should be elevated. For most patients, resting in an armchair is better than lying in bed. Relaxing and contracting leg muscles are important to prevent clots. As the patient improves, a doctor will progressively recommend more activity. Stress reduction techniques, such as meditation and relaxation response methods, may have direct physical benefits. Anxiety can cause the heart to work harder and beat faster. The goal of palliative care is to help the patient with a serious illness feel better. It prevents or treats symptoms and side effects of disease and treatments. Palliative care can help treat symptoms such as pain, shortness of breath, trouble sleeping, and loss of appetite. Palliative care also treats emotional, social, practical, and spiritual problems that illness brings up. When the patient feels better in these areas, he or she has an improved quality of life. Palliative care can be given at the same time as treatments meant to cure or treat the disease. You may get palliative care when heart failure is diagnosed, throughout treatment, during follow-up, and at the end of life. Any provider can give palliative care, but some specialize in it. Palliative care may be given by a team of doctors, nurses, registered dietitians, social workers, psychologists, massage therapists, and chaplains. It may be offered by hospitals, home health agencies, or long-term care facilities. Palliative care can begin at diagnosis and can be given at the same time as treatment. Fish oil contains omega-3 polyunsaturated fatty acids, a healthy kind of fat. Some, although not all, research suggests that a daily capsule of fish oil may help improve survival in patients with heart failure. The AHA considers omega-3 fatty acid supplementation as a reasonable adjunctive therapy for patients with heart failure. Your doctor may recommend a prescription brand of fish oil, which may contain higher and more consistent amounts of omega-3 fatty acids than nonprescription supplements. Vitamin E has been proposed as helpful for heart failure but studies do not back up this claim. In fact, some studies have suggested that vitamin E supplements may actually increase the risk of heart failure, especially for patients with diabetes or vascular diseases. There is no evidence that any particular vitamin can cure heart failure. In any case, vitamins are best consumed through the food sources contained in a healthy diet. CoQ10 is a vitamin-like substance found in organ meats and soybean oil. The evidence is mixed for supporting the claim that CoQ10 is helpful for heart failure. Patients should be aware that CoQ10 can decrease blood pressure and when used with blood pressure medications may make blood pressure too low. It can also interfere with the effectiveness of warfarin. Ginseng root should be avoided by patients with high blood pressure and those who take warfarin or loop diuretics.
. Hawthorn is a popular herbal remedy for treating heart failure and other heart problems but can be dangerous for patients with these conditions. This herb interacts with many prescription medications including blood pressure drugs, digoxin, and warfarin. Danshen is a root used in Traditional Chinese Medicine to treat heart and circulation problems. Danshen can interfere with the effectiveness of warfarin and digoxin. St. John's wort is an herbal remedy for depression. It can interfere with the body's absorption of digoxin. Abraham WT. Devices for monitoring and managing heart failure. In: Zipes DP, Libby P, Bonow RO, Mann DL, Tomaselli GF, Braunwald E, eds. Braunwald's Heart Disease: A Textbook of Cardiovascular Medicine. 11th ed. Philadelphia, PA: Elsevier; 2019:chap 27. Allen LA, Stevenson LW, Grady KL, et al. Decision making in advanced heart failure: a scientific statement from the American Heart Association. Circulation. 2012;125(15):1928-1952. PMID: 22392529 www.ncbi.nlm.nih.gov/pubmed/22392529. American Academy of Family Physicians; American Academy of Hospice and Palliative Medicine; American Nurses Association, et al. ACCF/AHA/AMA-PCPI 2011 performance measures for adults with heart failure: a report of the American College of Cardiology Foundation/American Heart Association Task Force on Performance Measures and the American Medical Association - Physician Consortium for Performance Improvement. J Am Coll Cardiol. 2012;59(20):1812-1832. PMID: 22534627 www.ncbi.nlm.nih.gov/pubmed/22534627. Dobre D, Borer JS, Fox K, et al. Heart rate: a prognostic factor and therapeutic target in chronic heart failure. The distinct roles of drugs with heart rate-lowering properties. Eur J Heart Fail. 2014;16(1):76-85. PMID: 23928650 www.ncbi.nlm.nih.gov/pubmed/23928650. Dunbar SB, Dougherty CM, Sears SF, et al. Educational and psychological interventions to improve outcomes for recipients of implantable cardioverter defibrillators and their families: a scientific statement from the American Heart Association. Circulation. 2012;126(17):2146-2172. PMID: 23008437 www.ncbi.nlm.nih.gov/pubmed/23008437. Goldenberg I, Kutyifa V, Klein HU, et al. Survival with cardiac-resynchronization therapy in mild heart failure. N Engl J Med. 2014;370(18):1694-1701. PMID: 24678999 www.ncbi.nlm.nih.gov/pubmed/24678999. Januzzi JL, Mann DL. Approach to the patient with heart failure. In: Zipes DP, Libby P, Bonow RO, Mann DL, Tomaselli GF, Braunwald E, eds. Braunwald's Heart Disease: A Textbook of Cardiovascular Medicine. 11th ed. Philadelphia, PA: Elsevier; 2019:chap 21. Jessup M, Atluri P, Acker MA. Surgical management of heart failure. In: Zipes DP, Libby P, Bonow RO, Mann DL, Tomaselli GF, Braunwald E, eds. Braunwald's Heart Disease: A Textbook of Cardiovascular Medicine. 11th ed. Philadelphia, PA: Elsevier; 2019:chap 28. Madmani ME, Yusuf Solaiman A, Tamr Agha K, et al. Coenzyme Q10 for heart failure. Cochrane Database Syst Rev. 2014;(6):CD008684. PMID: 24049047 www.ncbi.nlm.nih.gov/pubmed/24049047. Mann DL. Management of patients with heart failure with reduced ejection fraction. In: Zipes DP, Libby P, Bonow RO, Mann DL, Tomaselli GF, Braunwald E, eds. Braunwald's Heart Disease: A Textbook of Cardiovascular Medicine. 11th ed. Philadelphia, PA: Elsevier; 2019:chap 25. McMurray JJ, Packer M, Desai AS, Gong J, et al. Angiotensin-neprilysin inhibition versus enalapril in heart failure. N Engl J Med. 2014;371(11):993-1004. PMID: 25176015 www.ncbi.nlm.nih.gov/pubmed/25176015. Nguyen PK, Rhee JW, Wu JC. Adult stem cell therapy and heart failure, 2000 to 2016: a systematic Review. JAMA Cardiol. 2016;1(7):831-841. PMID: 27557438 www.ncbi.nlm.nih.gov/pubmed/27557438. Packer M, McMurray JJ, Desai AS, et al. Angiotensin receptor neprilysin inhibition compared with enalapril on the risk of clinical progression in surviving patients with heart failure. Circulation. 2015;131(1):54-61. PMID: 25403646 www.ncbi.nlm.nih.gov/pubmed/25403646. Patrono C, Baigent C. Nonsteroidal anti-inflammatory drugs and the heart. Circulation. 2014;129(8):907-916. PMID: 24566065 www.ncbi.nlm.nih.gov/pubmed/24566065. da Silva RMFL, Borges ASR, Silva NP, et al. How heart rate should be controlled in patients with atherosclerosis and heart failure. Curr Atheroscler Rep. 2018;20(11):54. PMID: 30225613 www.ncbi.nlm.nih.gov/pubmed/30225613. Tachjian A, Maria V, Jahangir A. Use of herbal products and potential interactions in patients with cardiovascular diseases. J Am Coll Cardiol. 2010;55(6):515-525. PMID: 20152556 www.ncbi.nlm.nih.gov/pubmed/20152556. Velazquez EJ, Lee KL, Jones RH, et al. Coronary-artery bypass surgery in patients with ischemic cardiomyopathy. N Engl J Med. 2016;374(16):1511-1520. PMID: 27040723 www.ncbi.nlm.nih.gov/pubmed/27040723. Wolk MJ, Bailey SR, Doherty JU, et al. ACCF/AHA/ASE/ASNC/HFSA/HRS/SCAI/SCCT/SCMR/STS 2013 multimodality appropriate use criteria for the detection and risk assessment of stable ischemic heart disease: a report of the American College of Cardiology Foundation Appropriate Use Criteria Task Force, American Heart Association, American Society of Echocardiography, American Society of Nuclear Cardiology, Heart Failure Society of America, Heart Rhythm Society, Society for Cardiovascular Angiography and Interventions, Society of Cardiovascular Computed Tomography, Society for Cardiovascular Magnetic Resonance, and Society of Thoracic Surgeons. J Am Coll Cardiol. 2014;63(4):380-406. PMID: 24355759 www.ncbi.nlm.nih.gov/pubmed/24355759.